What does one say about a hero like Robert Francis Kennedy that has not been said already? I do not even recall when I first discovered “Bobby.” All I knew from childhood was his brother John, the president who had been killed, and I knew that many black households, no matter the class or status, were likely to have photos of John and Bobby, with the Rev. Doctor Martin Luther King, Jr. in the middle. When I was a child, adults would speak in hushed tones about how they had all been killed: a president, a leader for black people and the president’s kid brother. It never dawned on me, throughout my youth and into my early adult years, to ask what Bobby had done—or, rather, what he had done to get himself killed. My curiosity always rested on his brother John, the 35th president. From elementary school through college, Bobby simply was never mentioned in my social studies, history, government or politics classes. It was not until the early 1990s, after college, that I even began thinking about Bobby Kennedy—and it was not positive. I remember thinking that Bobby was arrogant. That Bobby was a bully. That Bobby was his big brother John’s ruthless guardian of everything political, and reckless in his pursuit of suspected Communists and reputed mobsters. That Bobby saw himself as holier than others. That Bobby only got to be attorney general of the United States because of nepotism. And that as attorney general, a role designed to protect all Americans, Bobby was at times utterly clueless about the vicious racism in his own country. On his watch, civil-rights protesters were beaten and hosed and set upon by dogs. On his watch, the infamous head of the Federal Bureau of Investigation, J. Edgar Hoover decided to wiretap Dr. King, and Bobby went along. It has been suggested RFK agreed to do this to deflect Hoover from exposing the president’s string of extramarital dalliances, so the F.B.I. homed in on King’s lengthy spreadsheet of affairs instead. This was the Bobby that people did not like—liberals and conservatives, white folks and black folks alike. They perceived an absence of compassion and empathy for those beyond his immediate circle. And an insatiable thirst for power and control, by any means necessary. This is what the Kennedy boys had been raised to be: men of prestige, men of fortune, men of power. Bobby’s privilege, it seemed, blinded him to the everyday realities—and struggles—of the average American citizen. But then a singular event changed that forever: President John F. Kennedy was gunned down, in broad daylight. A vast nation had its love affair with Camelot abruptly dashed, and Bobby had lost his best friend, his big brother, his political twin—and his political shield. I can only imagine that he descended into an emotional darkness that felt, perhaps, like the way poor Irish people must’ve felt during the potato famine. Or the darkness Native Americans felt when Europeans stole their land, stomped their culture and massacred their people. Or perhaps the deep darkness Africans felt when they were kidnapped from their motherland, stuffed into ships like cargo, and brought to a strange new place as slaves, to be the victims of a very ugly and peculiar kind of skin hatred—racism. It was a hatred that became the very reason why they had finally gotten up the collective courage, in those very tumultuous 1960s, to fight for freedom and equality. 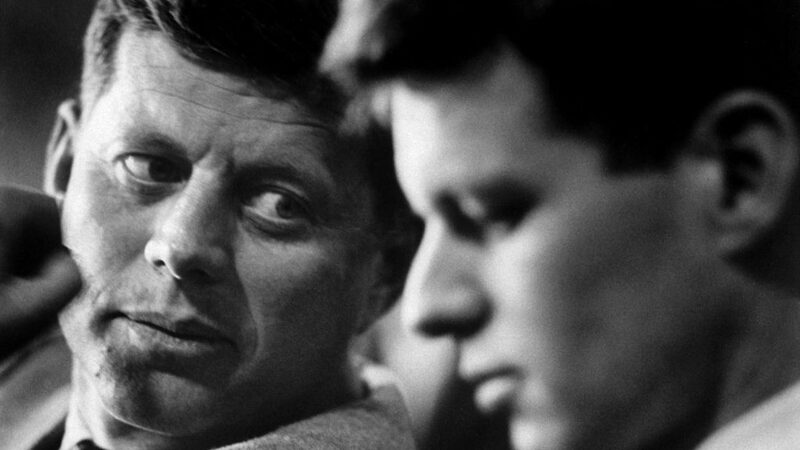 Yes, in that unending sadness Bobby Kennedy felt upon the death of his brother, in that deep depression that shrouded him with loneliness and fear and hesitation we know now that he understood, in his bones, that he had to emerge a different man, a changed man, a man of the people. And when Bobby showed up in public again for the first time, in the late summer of 1964 at the Democratic National Convention in Atlantic City, New Jersey, there was a thunderous and sustained standing ovation for him—for who he was, for what the country had lost. Bobby looked scared, overwhelmed, uncomfortable, and I would read that behind that big podium he was shaking as he spoke. He had been the one behind the scenes, the operator, the manipulator, and now here he stood, himself, naked before the world, vulnerable, unsure of who he was, of what to do next. The vast majority of white people and the vast majority of black people in this country want to live together, want to improve the quality of our life, and want justice for all human beings who abide in our land. VIDEO: RFK Speaks After MLK Killed Martin Luther King, Jr. was assassinated on April 4, 1968. That same night, Robert F. Kennedy delivered the devastating news of King’s death to a group of African-American supporters at a campaign rally. This is audio and video from that event. I do not know if I first watched that speech or listened to just the audio, or merely read it. What I do recall is that after I got through it I was stranded there in tears at his words. This privileged, wealthy white man had transformed himself from the bad Bobby to the good Bobby in less than five years, and he had become the one white man in America—in spite of its long history of racism—who could speak, with equal eloquence and equal compassion, to whites, blacks, Latinos, Native Americans, Asians, to any people anywhere. He had done it with sheer honesty, he had done it with grace, with dignity; and Bobby had found the compassion, the empathy, that had been missing. In the pain of mourning his brother’s death, it seems, he had resurrected his own humanity. He not only knew what it was to suffer, but he understood, at long last, what others felt who were suffering too. So, I cried because his words about Dr. King, about America, about the need for compassion and understanding and love, utterly blew my mind. I cried because I learned that Indianapolis was one of the few major American cities that did not spiral into chaos, torching buildings and streets on the night MLK was shot and killed. I cried because this would be the only time Bobby would ever mention in public the assassination of his brother. I cried because that speech, one I have watched and listened to and read countless times since, so touched my spirit, that I instantly fell in love with who this man was, who he had become, just as I had done with Malcolm X when I first read his autobiography as an 18-year-old college kid years before. I am one of the many boys in America who never had a father so I, we, search for manhood from many angles, search for fathers and father figures and mentors and, yes, heroes, wherever we can find them. So, as I did with Malcolm, and Dr. King, too, I found myself digging for more. More Bobby speeches. More Bobby photos. More Bobby videos. More Bobby interviews. I was so transfixed by this man to the point that I found myself memorizing and quoting his words the way Bobby would memorize and quote one poet or philosopher or another. I found myself tracing his life steps—the good, the bad, the ugly, the genius, the many contradictions—so that I could learn something of myself as a human being, as a man, as someone who had also committed my life to serving and helping others. I had to know Bobby, had to study him, had to know about his wife Ethel, their 11 children. I had to understand that John F. Kennedy’s death caused Bobby to be born, again, as a freedom fighter, as a fearless champion for the underrepresented. I saw that Bobby learned, through the tragedy of his brother’s death, that privilege meant nothing if it was not used to empower others, to highlight oppression, inequality, if it were not used to help the powerless become powerful, too. I found myself buying Bobby Kennedy posters and magazine covers in the late 1990s and into the 2000s and framing them for my apartment walls. I found myself seeking out people who knew him, who had worked with him, or had worked on his 1968 presidential campaign. I found myself studying what happened to his children: the stunning successes, the twisted acts of fate that seem to encircle this very American family generation to generation. I found myself using words that Bobby used, thinking ideas Bobby thought, of being a bridge-builder, as he attempted to be in the last four years of his life. I found myself looking up people who were Bobby’s allies, the folks in Brooklyn, New York where he helped to establish the Bedford-Stuyvesant Restoration Corporation, and the folks in California who were farmers, with names like Dolores Huertes and Cesar Chavez. I found myself tracing Bobby’s limited time as a leader, from that 1964 Democratic National Convention, to his race for the Senate in New York state, to his winning that seat, to him climbing a mountain in honor of his slain brother, to his bold speech about white supremacy in South Africa, to him visiting the Mississippi Delta and Appalachia to shine a huge light on poverty in the U.S. I found myself enthralled as Bobby came to oppose the very Vietnam War his brother helped to escalate—as he, Bobby, supported that escalation. And I found myself wondering if Bobby knew he too would have a short life, if he cared or not, if he were afraid or not, and if fear had something to do with him hesitating to declare himself a candidate for president, knowing he might not make it to the White House. And I felt, always, a heavy sadness about Bobby as I studied him closely in those final chapters of his journey. Perhaps this especially explains his embrace of black America, how our pain became his pain, how our struggle became his struggle. Because aside from Native Americans no other people in this land have known the blues like us, have sung the blues like us, have been hated on like us. I saw in Bobby, this dead white man, the kind of true ally to black people, to people of color, to any disempowered group, who was so badly needed. Bobby knew that the casual racism of the average white American would dismiss the legitimate cries from people dark like me. So as the true ally he became took up the mantle of leadership in its purest form: be selfless, be bold, be creative, build and leave something that will survive you and touch generations not yet born. I think if there are two singular events that capture the essence of my feelings for Bobby Kennedy they are these: In 2012, I got invited to a private film screening with my great friend Michael Cohen, a Jewish brother who, as a teenager, had worked on RFK’s 1968 presidential campaign. Mike would tell me often that he could never bring himself to work on another political campaign again—until I ran for Congress in Brooklyn in 2008 and 2010. Now that I think about it, I am sure some of the information I have received through the years about Bobby has undoubtedly come from Michael. Like me, he sees in Bobby both human greatness and human frailties, and a man, a being, completely unafraid to show either by the end of his life. The movie we went to see was Ethel, about Bobby’s long-widowed and still-living wife. A captivating and beautiful portrait of the woman who stood with and next to Bobby through it all, and who was there with him that sad June day in 1968 when he too was assassinated. After the film was over we got to meet two of Ethel’s and Bobby’s children, their daughters Kerry and Rory. It was Rory who made the film, who had gotten her mother to talk, on camera, in a way she had never done before. I thanked Rory for doing it, for honoring her mother, for honoring her father. I do not remember her reaction completely, but I do remember the humility, and how much Rory looked like her father. The youngest of the 11 children, Rory is the one who was in her mother’s belly when her dad was killed. She would be born six months after her father’s death. The other scene that remains with me about Bobby took place at the Oakland Museum in the Bay Area of California just a couple of years back. It was during an exhibit called “1968,” which rightfully piqued my interest as America was approaching the 50th anniversary of arguably the most explosive year in its history. I was rightfully intrigued too, as a lover of history, as someone who is always looking to learn new and different things about that entire decade. There were television shows and television commercials. There were the fashions and words and catchphrases of the day. There were tidbits about the music of 1968 and the entirety of pop culture of that year. Of course, there was much about the unrest and activism of 1968. And there was the section on Dr. King and his assassination, which drew a deep sigh from me the longer I stood there gazing at the images of him, of how his life was ended. But it was when I made my way to the tribute for Bobby Kennedy, who had spoken so movingly on the night of King’s death, that I lost it entirely. 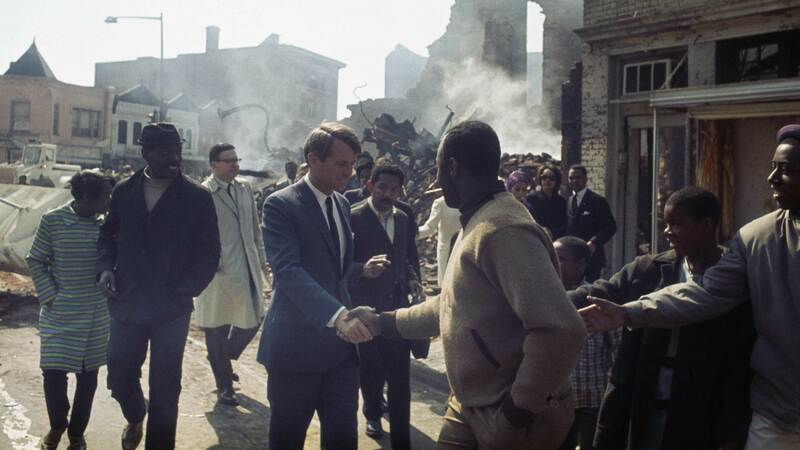 A rainbow coalition of us stood around the Bobby portion of the “1968” exhibit and fixed our eyes on the video of the day RFK’s casket was aboard a purposely snail-like train that carried his body from New York City down to its final resting place next to his brother John at Arlington National Cemetery. I looked around me and I saw people of all races and cultures, all gender identities, all ages, some old enough to have remembered when Bobby had died, some like me mere babies in 1968, and quite a few millennials, or younger, even. 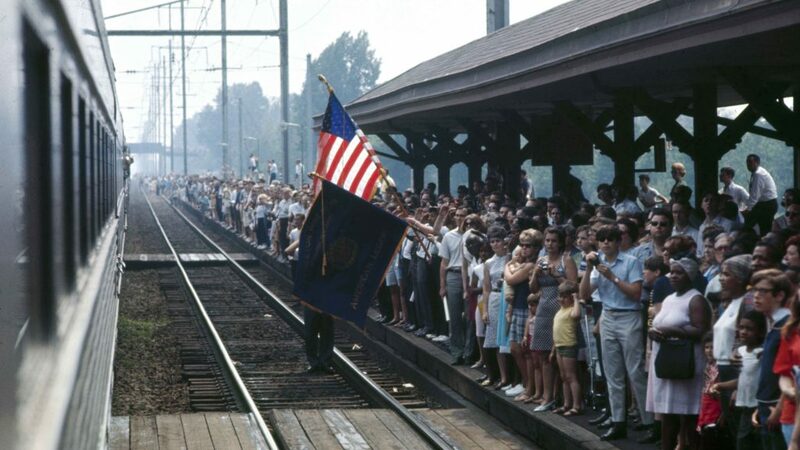 There was total silence as we absorbed the video of an equally rainbow coalition of Americans, locked into that mind-jarring moment in 1968, as they stood on the side of the railroad tracks staring, pointing, crying, clutching each other, waving American flags—whatever they could do to let Bobby Kennedy know what he had meant to them, or how they felt about his fate, the same fate that had swallowed his brother, and Dr. King just two months before. I cried in that moment for a man I had never seen in person, for a man I had no memory of as a child, whose history I did not encounter until I was well into my adult life. I thought about Bobby’s last speech there in that ballroom of the Ambassador Hotel in Los Angeles, after he had won the California Democratic Primary, and was seemingly on his way to winning this party’s nomination to be president of the United States. I thought about what it must have felt like to leave the podium of that packed ballroom to cheers, to be rerouted, at the last minute, in a different direction, and without proper security, through the kitchen area, to shake the hand of the young Latino male who had met him at another time at that hotel while delivering room service, and who simply wanted to shake Bobby’s hand once more as a thank you for recognizing his humanity. And how Bobby was gunned down in that moment, he and others, in that kitchen area. And how that young Latino man placed religious beads in one of Bobby’s hands, then held Bobby’s head tenderly as he struggled for sight and breath and life; yet his eyes betrayed that struggle, knowing it was over. Yes, we cried at that Oakland Museum, friends, families, strangers, as we watched that train carry a fallen hero to his final resting place. I do not like to speculate and think about what ifs with anyone. What if she or he had lived, what if she or he had not been killed. I just think that Bobby was who he was for the time he was here, and his life, what he left us, is a great testimony to the power of personal transformation. I do not know if he ever got over what happened to his brother. But I do believe that in his brother’s death Bobby was forced to find his way, to stand as his own man, to be a leader, finally, in his own right. And little did he know, as he was talking about poverty in America in that time, that fatherless poor children like me would grow up to discover him anew, to study him from multiple angles, to see in his words and his deeds the possibilities for a very different kind of America, where all would be equal, could be equal, could have opportunities, could be anything they wanted to be. This is how I prefer to remember and honor Bobby Kennedy in this 50th anniversary year of his sad and tragic death. That his life was not in vain, that some can choose to only highlight fragments of his life—if that even. But you cannot suppress or ignore a king of a human being who, flaws and all, made a conscious decision to turn his own personal trauma and pain into power and possibilities for others. Kevin Powell, activist, writer, public speaker, is the author of 13 books, including his critically-acclaimed autobiography, The Education of Kevin Powell: A Boy’s Journey into Manhood. His 14th book will be a biography of Tupac Shakur. You can follow him on twitter, @kevin_powell, or email him, kevin@kevinpowell.net. 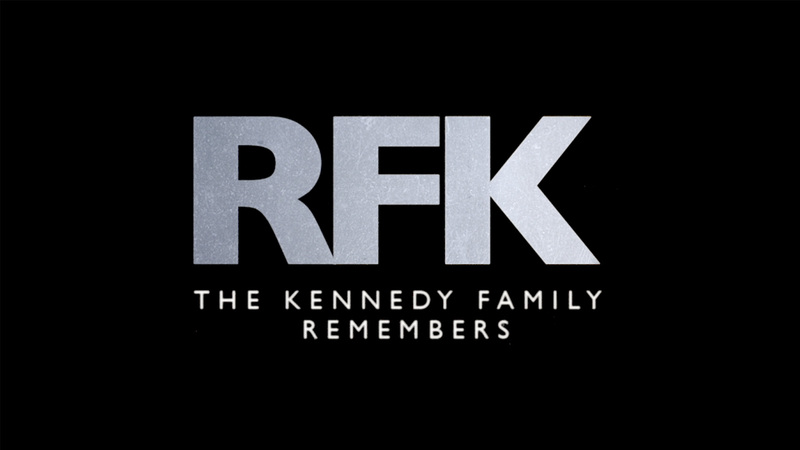 RFK: The Kennedy Family Remembers, a new HISTORY special about the life of Robert F. Kennedy, premieres tonight at 10/9c. Get more information now.